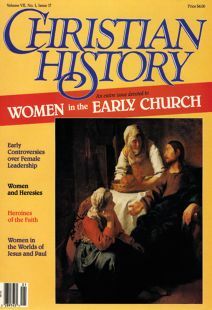 Introduction to Women in the Early Church and a looks at Christian History's point of view. Is there not perhaps some better way to give women the real place they’ve had in history? Early sources speak about Christian women. A number of prominent leaders, scholars, and benefactors of the early church were women and— despite neglect by many modern historians—the diligent researcher can still uncover a rich history. Of course not only women were attracted to the heretical sects that diverged from early church orthodoxy, but women were prominent in their leadership and teachings. Why might this have been? Who was who among women (real and fictional) in the early church. Early church historians tell of the accomplishments of Christian women. This close friend of the scholar Jerome, known for her scholarship and her extreme piety and generosity, was one of the most noteworthy people—women or men—in all the 4th-century church. Questions about women’s role in church are almost as old as Christianity itself. Chronology of women in church orders. Did unnecessary restrictions stifle the Spirit in the early church. In His treatment of women, as in many other areas, Jesus of Nazareth was a radical contrast to the standards of His times. About 200 A.D., under the reign of Roman emperor Septimius Severus, persecution broke out against the Christians. It was particularly severe in North Africa. Augustine considered his mother, Monica, a driving force in his own salvation. Fictional Thecla was revered through much of church history. One early author describes a woman's sphere. Excerpt from an early church document elevates virginity. From the bitter persecution of Diocletian (303–305), a young heroine emerged. Egeria made the trek from western Europe and kept a diary of her travels. Historical writings and pespectives, Scripture studies, bibliographies about early church women.